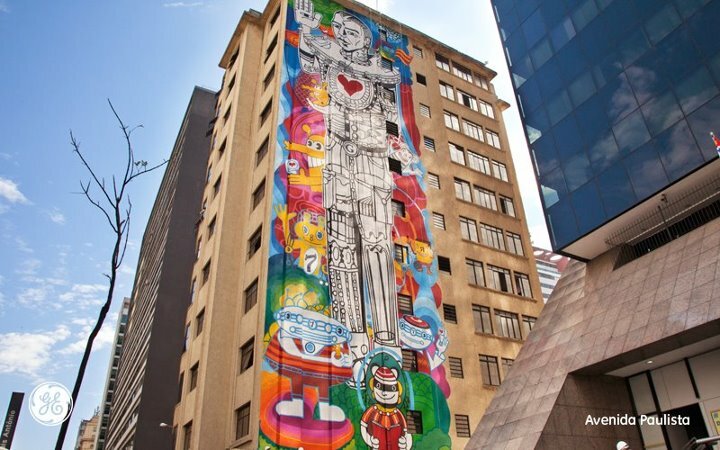 The city of São Paulo has been free of outdoor advertising in the last five years, thanks to the Clean City Act which resulted in the removal of thousand of billboards. The result? A city which is ad-free, but which some also describe as grey and cold. Recently, the mayor’s office announced that the city would accept proposals for public graffiti art to beautify the urban environment. Spying a loophole, GE stepped in with its Brazilian ad agency, Almap BBDO, and the GE Gallery project was born. Three 120-foot panels by street artists now appear on the sides of buildings in São Paulo, each centered around one area of GE’s business: energy, health and transportation. This week, the GE logo will be added to the bottom portion of the panels, and a social media campaign will begin allowing Facebook users to vote on which artists will paint the remaining two panels. An augmented reality app will also be launched in September to tie with the transportation-themed panel. This is all very smart of GE. Not only are they positioning themselves as friends of the city–one Almap exec describes the panels as “a gift for the people”–but they also don’t have to compete with other visual clutter. To imagine the impact this might have on someone walking the streets of São Paulo, picture Times Square with no ads. Now picture it with just one ad. Where would you look? Ads and art do not have to be mutually exclusive, nor is it necessarily sneaky or deceptive as a marketing practice to make an ad look as pleasing as a piece of fine art. But when a city announces that it will open its walls to street art, and then accepts GE-commissioned pieces which exalt GE-related business and include a GE logo, let’s call it what it is. Outdoor advertisements have returned to São Paolo. ← NYC Teens! Ready to fight back against media stereotypes?